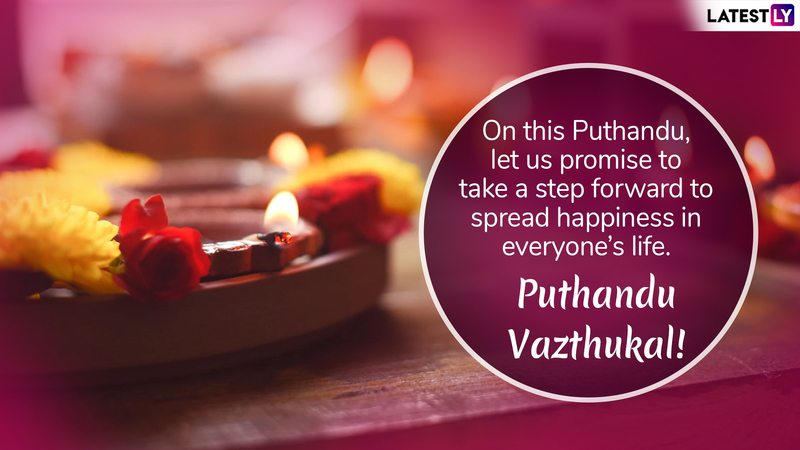 The day to wish “Puthandu Vazthukal” is finally here. Yes, it’s Tamil New Year and one cannot contain their excitement. While we commemorate New Year Day on January 1 as per the Gregorian calendar, but there are several days throughout the year celebrated as New Year's Day in the different regions of India. 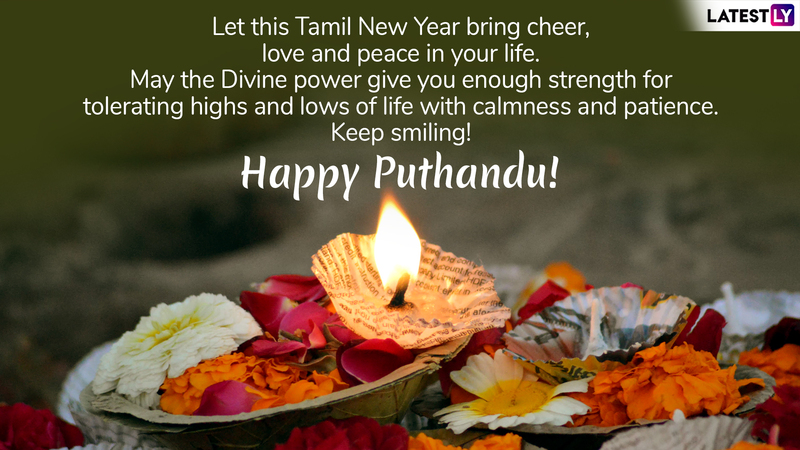 Tamil Puthandu (Tamil: தமிழ்ப்புத்தாண்டு), also known as Tamil New Year is the first day of the year as per Tamil calendar, a sidereal Hindu calendar used by people in the state of Tamil Nadu. The day is celebrated with great fun and fervour with people greeting each other “Puthandu Vazthukal” meaning “Happy New Year.” We bring a collection of Puthandu Vazthukal 2019 greetings in Tamil, Puthandu Vazthukal images, best WhatsApp Stickers, Hike messages, Tamil New Year wishes, GIF image messages, SMS and quotes to Wish Happy Puthandu 2019. Puthandu Vazthukal Images & HD Wallpapers for Free Download Online: Wish Happy Tamil New Year 2019 With GIF Greetings & WhatsApp Sticker Messages. There are so many ways to wish in Tamil like "Puttāṇṭu vāḻttukkaḷ!" (புத்தாண்டு வாழ்த்துக்கள்) or "Iṉiya puttāṇṭu nalvāḻttukkaḷ!" (இனிய புத்தாண்டு நல்வாழ்த்துக்கள்), which is equivalent to "Happy New Year". It is always exciting to send good wishes in native language. Yes, we understand it can be tricky but if done correctly, it shows that you care for the other person. And just in case if you do goof up, your friend or close one would love the fact that you at least gave a shot. If you have a best friend who is celebrating Tamil New Year, you can surprise them by sending wishes and greetings in Tamil. Don’t worry, we also have Puthandu wishes in English along with Puthandu Vazthukal images, Puthandu Vazthukal messages and more. Puthandu 2019 Wishes in Tamil: Facebook Greetings, WhatsApp Stickers, GIF Images to Celebrate Tamil New Year. 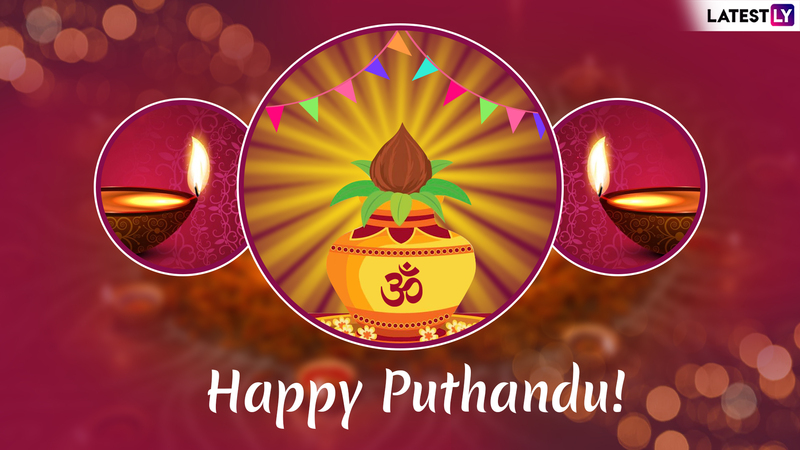 If you wish to brush up your knowledge on Puthandu or Tamil New Year, you can read all about the Tamil Puthandu Significance and Celebrations of Ringing in Tamil New Year here. It is similar to Hindu New Year’s Day celebrations that take place in other Indian states like Gudi Padwa in Maharashtra, Ugadi in Andhra Pradesh and Karnataka, Poila Baisakh in West Bengal, Rongali Bihu in Assam, Vaisakhi in Punjab, Juir Seetal or Maithili New Year in Bihar and more. 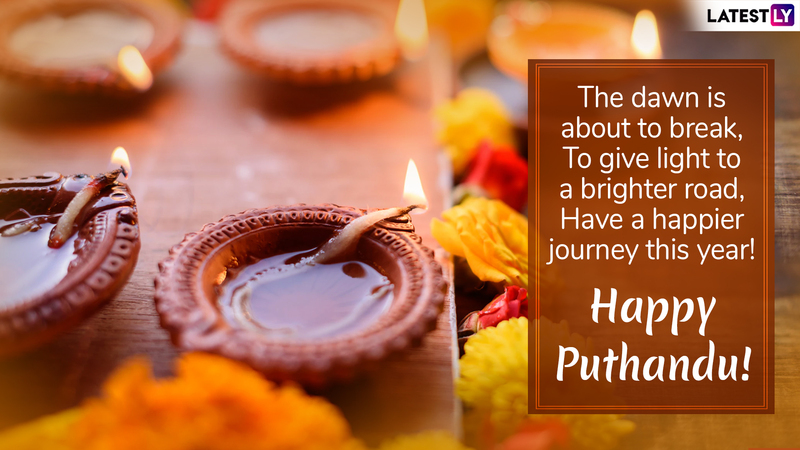 Puthandu celebration is not only limited to Tamil Nadu in India, but also observed by the Tamilian diaspora in Sri Lanka, Malaysia, Singapore and Mauritius. Happy Puthandu 2019 Wishes: WhatsApp Stickers, Messages, Puthandu Vazthukal GIF Images, SMS & Photos to Send Tamil New Year Greetings. 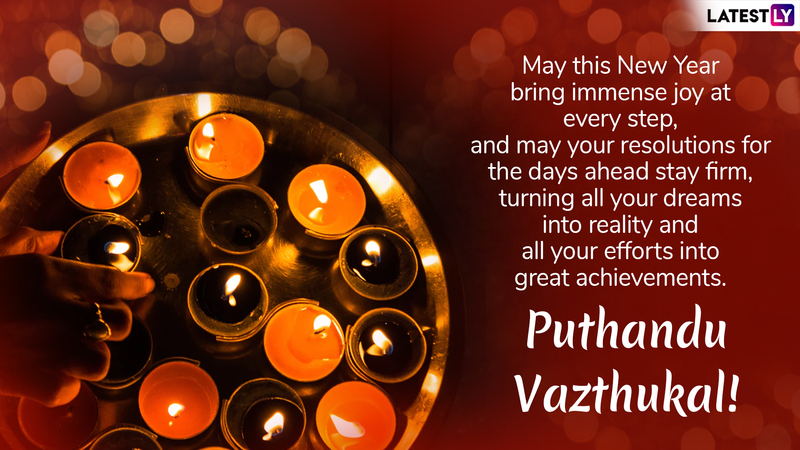 Coming back to Puthandu Vazthukal wishes and greetings, please scroll down for the vast collection of Puthandu Vazthukal images, Puthandu Vazthukal wishes, Puthandu Vazthukal greetings, Puthandu Vazthukal 2019, Puthandu Vazthukal messages, Puthandu wishes, Happy Puthandu 2019 messages, Puthandu images, Puthandu SMS, Puthandu photos, Puthandu messages in Tamil, Puthandu wishes in English, Puthandu greetings and more. Puthandu Recipes 2019: From Panakam to Paruppu Payasam, Relish These Traditional Tamil New Year Dishes. WhatsApp Message Reads: Every End Is a New Beginning. Keep Your Spirits Unshaken and You Shall Always Walk on the Path to Glory. Happy Puthandu! WhatsApp Message Reads: On This Puthandu, Let Us Promise to Take a Step Forward to Spread Happiness in Everyone’s Life. Puthandu Vazthukal! WhatsApp Message Reads: The Dawn Is About to Break, to Give Light to a Brighter Road, Have a Happier Journey This Year! WhatsApp Message Reads: May This New Year Bring Immense Joy at Every Step, and May Your Resolutions for the Days Ahead Stay Firm, Turning All Your Dreams Into Reality and All Your Efforts Into Great Achievements. Puthandu Vazthukal! WhatsApp Message Reads: Let This Tamil New Year Bring Cheer, Love and Peace in Your Life. May the Divine Power Give You Enough Strength for Tolerating Highs and Lows of Life With Calmness and Patience. Keep Smiling! WhatsApp Message Reads: Happy Puthandu! May this new year bring all the goodness in your life. 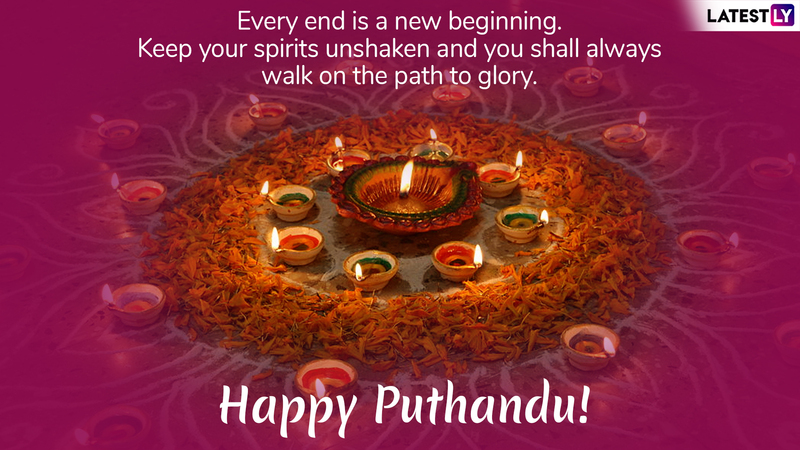 Let this Puthandu be the beginning of a better life. Let this New Year end all sorrow and bring light and joy. Happy Tamil New Year Puthandu Vazthukal 2019 to all.